I’m very thankful to Allah (God) for this privilege to come before you once again to talk about the “New Beginning.” It is always a blessing when you’ve run a certain course, and God, out of His mercy, grants a chance for a new beginning. For people who have had the unfortunate experience of being incarcerated and paying their debt to society, when they’re released from that, their hope is that they can make a new beginning. Society is so unkind that even when someone has paid their debt to society, society keeps reminding them of mistakes and errors of their past, and continues to punish them without ever recognizing that human beings, no matter how depraved at one stage of our development we might be, we all, within us, have the possibility for change. This man that the scripture speaks of also grows up among thorns; and he evolves. When he is fully evolved, even that which he produces is just like him: A thorny beginning. As it evolves, what this man produced turns into a beautiful bud. Then, into a flower that opens, bringing forth a sweet fragrance that can change the foul odor of a society. The problem is making sure you have a good knowledge and understanding of him who makes things new. Not spending your life talking about him, but you getting into him, and allowing him to get into you. And when that one that Allah (God) has made new enters into you, by your permission, then he in you begins to renew you. That is a beautiful picture. Well, how does he get into you? Both the Bible and Qur’an teach that the vilest of creatures are “the deaf” and “the dumb.” The vilest of creatures are those who refuse to hear because that’s the way the one who makes things new, enters you: He enters in through the ear by your being receptive to a word. The Bible teaches “In the beginning was the word and the word was with God, and the word was God,” and all things were made by Him. So this word is so powerful that when we allow God’s word to enter us, it has the power to give all of us who receive it a new beginning. To appreciate this stage of our development, we have to appreciate the coming of One Who came to us from the Holy City of Mecca in Arabia: Master Fard Muhammad—a man who had a Black father and a White mother which gave Him a complexion that allowed Him to easily mix with the Caucasian people of this nation and other places of the world. Master Fard Muhammad said he visited every inhabited part of our planet. He said he spoke 16 languages and wrote 10 of them. He said he pictured and extracted the language of the people on Mars and taught us that there was life on Mars, and life on every planet in our universe. The difference is that each planet has different water, but wherever you find water, you will find life. He taught us this 78 years ago, and now the Caucasian has developed an instrument that they sent to Mars and they believe now they have discovered ice, water. Master Fard Muhammad taught us that we had arrived at the end of the present world and that a new world was coming in. He taught the nature of our selves and the nature of the Caucasian people. He taught us the profound knowledge of others and he taught us that Islam was the nature in which we were created and are created; and that submission to the Will of God is the true religion of God and all his prophets no matter where they appear on the earth. Master Fard Muhammad was somewhat of a mystery in that He didn’t readily make himself known for whom he really was, but He assumed many different names or titles. He came among us as the Bible teaches he would, as “a thief in the night.” He came among us to do a work of transformation of us fulfilling what is written in the scripture that the Son of Man would come out of the East even unto the West, and He would search and find His people who were lost and revive them from their state of mental death and ignorance. All of the mosques set up by the Honorable Elijah Muhammad are committed, first and foremost, to the resurrection and transformation of the Black people in America and throughout the world, for it is our condition that is worse than any member of the human family of our planet. So, He comes to the worst to start His work of redemption. Who is this man that came among us, the Black people of America? In the 24th Chapter of the Book of Matthew, it says, “As lightning shineth from the East, even unto the West; so shall the coming of the Son of man be.” The Son of Man would come having the knowledge, wisdom and power to give light to a dead people that were living in the West among another people who had robbed them and spoiled them and made them other than themselves. The Son of Man—what a title. 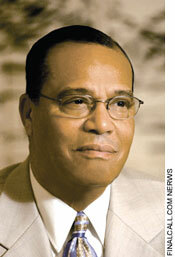 This man who came, He pointed out to the Honorable Elijah Muhammad a dreadful looking plane in the sky. He said it was a manmade mechanical object measuring a half-mile by a half-mile; and in it were 1,500 little planes made like the sphere of spheres—the universe. But these are “little wheels” that Ezekiel saw 595 B.C. He had a vision of a wheel in the middle of a wheel, in the middle of the air that was a cloud by day and a pillar of fire by night. And today, The Wheel that Ezekiel saw, that Master Fard Muhammad pointed out to the Honorable Elijah Muhammad around 1931, is a reality that is being talked about by governments and scholars and scientists all over the world. They call them UFOs (Unidentified Flying Objects). They’re not from another planet, brothers and sisters. They’re not aliens. They’re human beings just like you with superior wisdom to the wisdom of this world. That is why the government of America calls it “Top Secret,” because it cannot bring itself to admit that there is another Power; that there is more wisdom greater than any wisdom that they have. And that this sphere of spheres that is up above our heads, this government has no power to defeat it. It is there for two reasons: One, is the destruction of the wicked; and, two, is the planting of a brand new civilization on the earth. The scripture teaches, “And I looked, and I saw a New Jerusalem come down from heaven as a bride adorned for the bride groom.” This is not talking about “old” Jerusalem; the New Jerusalem it is speaking of is The Wisdom that is coming down to the earth from Allah (God) that will give ordinary human beings power to do extraordinary things. No matter how wise you think you are with the many degrees that you have received from this world, God looks at all of the wisdom of this world, and calls it foolishness, because with all of the wisdom that we have achieved, none of it is strong enough to change the reality of the present world. The complexities of the problems of the present world cannot be solved with the present-day wisdom. One of these Sundays, I want to set it aside just to teach Caucasian people, because I want to teach you what God has revealed about your origin in this world and the purpose for your existence. And why now, with the manner in which you have been living your life, you will not be able to see what God makes new except you submit yourselves to become new, as the Bible teaches. We have to be born again. For over 30 years I have been saying that America’s policies are off, and I have been persecuted as though I was saying something that shouldn’t be said. I live here; I’m not anxious to see the country that I live in, fall, but we are a witness of power being displayed in the force of nature that no president has power over. If they did, they would stop the fires from the west coast, the floods on the east coast, the drought in the South. Open your eyes and know that God is present! We don’t hate the country in which we live! We hate the injustice that is bringing America to the bar of judgment. But both Barack Obama and John McCain are saying now that America’s policies are wrong. The next president will have to lead America in a time of tremendous crisis. Jesus talked about wars and rumors of wars—all these things which are happening now. It’s written in the Book of Luke how men’s hearts will be failing them with fear for the things that they see coming upon the earth; and the Qur’an says, “The shock of the hour, when it comes, little children will become grey-headed at the horror of what they see.” We’re on the verge of a great change. America does have the potential to change the world—but America, itself, has to be changed. What a trial for America today, but in this equation is a young man with a Black father and a White mother. Who, in his DNA, all he’s thinking about is how to bring Black and White people together with mutual respect. What a trial for America, because Barack Obama is bringing out the best in White people. And unfortunately, he’s also bringing out the worst. You listen to some talk shows—there are people outright talking about killing the brother. My God … what will that say to all of the people—Black and Brown and White and Asian—who stood in line for three, four, five hours to vote for this young man; or, to vote for Senator McCain and Sarah Palin? What will it say to the children, who have been energized in a way that they have never been energized by this brother and his brilliant march for the presidency of the United States, if he is hurt? What will that do to the hope that is in the breasts of so many? But then others are going to go out in the street and celebrate with wild joy and revelry as though it was the Philadelphia Phillies winning the World Series. But that’s not wise, because your joy is somebody else’s sadness. And in your moment of revelry, there are those who will be so angry they can’t get to him—but they can get to you. So my counsel to you would be if he wins, rejoice intelligently. The 110th Surah of the Holy Qur’an says it like this: “When Allah’s help and victory comes, And you see men entering the religion of Allah in companies, celebrate the praise of thy Lord, and ask His protection ...” I’m not talking about a victory in terms of men and women coming to the ranks of Islam in companies; I’m talking about a victory that we never expected, but now we’re full of expectancy of, because we heard the polls. If Barack Obama wins, celebrate the praise of God Who brought us from a mighty long way, and made us in a time like this to ascend to the highest post in one of the greatest countries in the history of the world. Don’t act foolishly, because Obama’s rise is the rise of all of us who would be risen by his rise; who would be inspired by his rise. On October 19, I said that America has lost a lot by disconnecting politics from religion. God sent prophets, and He raised kings. The prophets had a relationship to the kings, and the kings knew that relationship. And as long as the prophets could say to the kings, “Thus sayeth the Lord,” and the kings obeyed, then they could produce a political kingdom that showed the signs of Life, Liberty and the Pursuit of Happiness. The corruption that came into the spiritual world ill-affected the political world. This led to all kinds of breakaway religious sects, because Satan had corrupted the church, the mosque and the synagogue. So everytime somebody broke away from the parent church, they made another one and put the name of the breakaway leader on that phase of their religion. The Founding Fathers of America separated the functions of government from the institutions of religion, but they never meant that religion should be denied in politics. One should be the outgrowth of the other. Did you know that on July 4, 1776, the day when the American colonies declared their independence from Great Britain, which ignited the Revolutionary War, the Continental Congress appointed Benjamin Franklin, Thomas Jefferson and John Adams to design a seal of the new nation? Of course, we know that this seal was not accepted because of America’s involvement in the Trans-Atlantic Slave Trade. But they always knew that our presence in America as slaves would one day be a great trial for this country. In the Book of Deuteronomy, God says to Moses: “I will raise them up a prophet from among their brethren like unto thee, Moses.” You wouldn’t need a new Moses if you didn’t have a similar condition of oppression, slavery and torment. “And I am going to put My words in his mouth, and he is going to speak unto them all that I shall command him.” What I am saying is that we are the modern slave in need of a modern Moses. There is healing in His wings not just for us, but also for the White people who wish to be purified from that which they were taught to make them rulers in the earth not based on the principle of justice. He has healing in His wings for you. And so, my beloved brothers and sisters, I thank you so much for reading these words. I thank you—the Believers—for being patient with me as we try to move the Nation of Islam into its broader mission. But before you can move out into the broader mission, the scripture teaches that you can’t put new wine in an old wineskin, lest the wineskin break and the new wine spill out. We need to make a new person to receive that mission.